The main stage in front of Ayres Hall on The Hill. You all might be familiar with a little show called Today with Kathy Lee and Hoda? 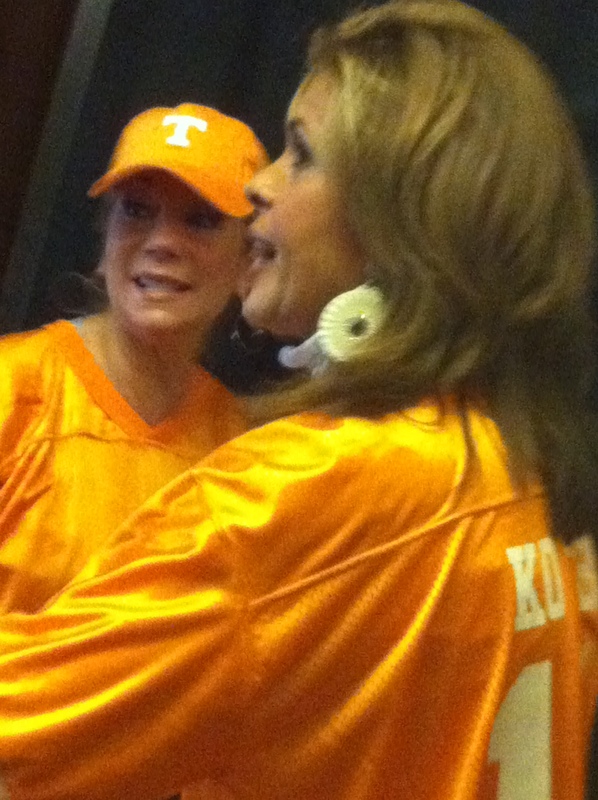 Yeah, well they came to UT yesterday. NBD (No Big Deal) right? Umm wrong! It actually was kind of a big deal. Now I’m not a loyal follower of the show or anything, but if a nationally recognized TV show comes to campus I’m going to be excited. I mean I listened to Kathy Lee Gifford’s lullaby tape when I was a little girl so this lady is practically my childhood. OK so that’s taking it a little far…but still. I grew up with her and her kids (sort of)! Also, I’m never awake in time to see Matt Lauer and Co. KLG and Hoda’s segment is a bit more familiar to me. 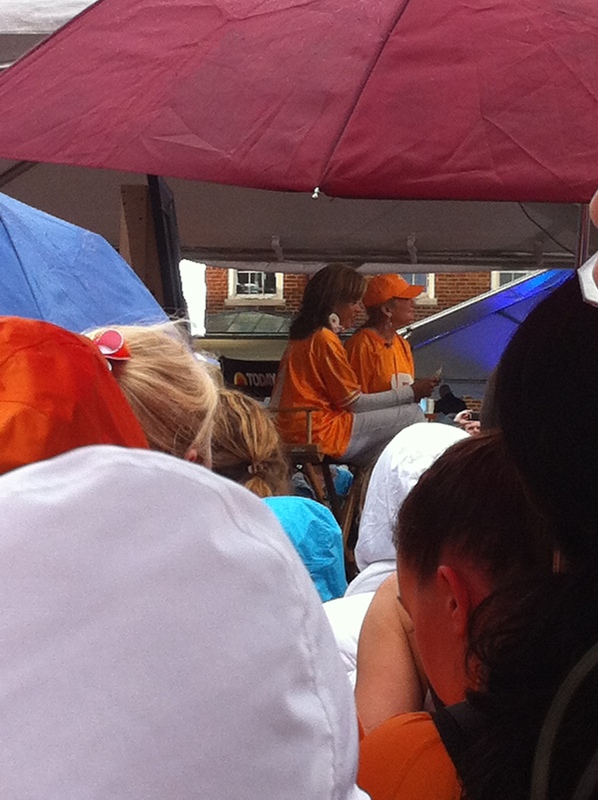 Anyway, UT won the contest for “Kathy Lee and Hoda Go Back to College” or whatever meaning we had the most votes for them to film a live show on our campus. Pretty cool, non? Just want to say, no zoom on this pic! Luckily, I had class at 9 a.m. in the building (Ayres) directly behind KLG and Hoda’s stage soooo kind of a winning over here. I skipped my 10:10 class and stayed to take blurry pics in the steadily falling rain (who says I’m not loyal?). It really was pretty cool to see all that goes into taping a one hour morning show. The amount of makeup everyone on TV wears is insane! I didn’t have a stitch on and now I’m really hoping I didn’t show up on TV because no makeup + rain + 6 hours of sleep = me at my worst. Kip Moore made a guest appearance and performed. Pat Summit came out too and the “Ambush Makeover” featured two teachers which was pretty cute. The verdict: definitely worth missing a (Gen Ed) business speaking class. 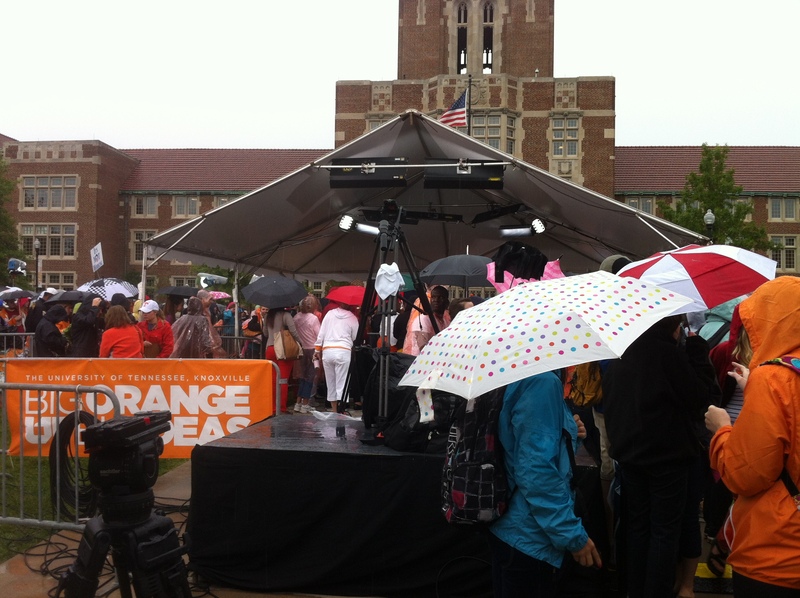 How many times in your life do you get to see a morning show filmed live on a college campus? Exactly. Not a bad Monday I’d say.